I just finished reading The Third Man: Life at the Heart of New Labour by Peter Mandelson (ordered from Amazon UK so I could get a copy right away). Mandelson was one, and probably the least well-known, architect of the Labour Party’s rebranding and rise in Britain (along with Tony Blair and Gordon Brown). The political memoir traces Mandelson’s experience in Labour Party politics from his early life until the final days of Brown’s government. It is definitely an interesting read. Despite all the criticism it has received in Britain (here, here, and here), it is a great book for anyone interested in one behind-the-scenes account of British Politics over the past 13 years as well as anyone interested in understanding how a hugely successful brand can succeed and ultimately fail (Labour lost the most recent election in May to David Cameron’s Conservative Party). Most interesting, and particularly telling for Canada, is his description of the feud between Blair and Brown and its parallel with the Chretien/Martin rivalry. Brown, as Mandelson describes, had never fully accepted Blair’s ascension as Labour leader and continually undermined Blair’s efforts to modernize both the party and Britain. Using his power as Chancellor and his support within the Labour caucus, Brown was as much Prime Minister as Blair was. Interestingly, the book underscores the power the Chancellor has in power and relative weakness of the British PM in comparison to that in Canada. There were many times when I was actually shocked at how little power the British PM actually has in pushing his/her agenda through. Mandelson is both a supporter and detractor of Gordon Brown. I’m never really quite sure what he thinks about the man but for the most part, Mandelson pulls few punches in describing Brown’s demeanor and behaviour during the Blair years. How much of this is true – it’s hard to say. Especially as someone who doesn’t follow British politics enough to really know what happened during this period. The lesson for Canadian politic junkies relates to the power of the PM. The Canadian PM, at least when we consider Chretien and Harper’s administrations, has significantly more power. Mandelson writes that “Tony lacked the machinery and the mindset to exert presidential power over government” (228). He notes that the Prime Minister’s Office lacked the structure to set the agenda and ensure “all departments were on the same page and moving forward with the decisions require” (228). The British PM, although the chief executive, does not have the centre of power and influence we often criticize the Canadian PM of having. 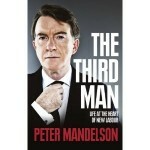 Mandelson himself is an intriguing character. Described as the “Prince of Darkness” of British politics, Mandelson’s experience in politics is extensive and his book is a useful guide to anyone interested in catching up on what happened in Britain over the last 25 years. He was elected to the House of Commons in 1990, served in three cabinet roles (twice having to resign), acted as Trade Commissioner for the European Union and is currently in the House of Lords. “The government needs principally to concentrate on the future by addressing the conditions for people to get on in life, to make the most of themselves, instead of such opportunities being dependent on the privileges of birth, of wealth, who you know and the contacts that well-connected families and friends can provide. For me, the goal of social democracy is to create the sort of society in which the daughter of a Hartlepool shop assistant has as much chance of becoming a High Court judge as the daughter of a Harley Street doctor” (562). This is the kind of messaging that any political party on the centre or centre-left needs to embrace. I highly recommend this engaging, yet long (566 pages), account of one of the most interesting actors in British politics. I certainly learned a lot.